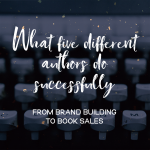 It’s no secret that characters are important for the success of any story—but oftentimes we fail to create characters that are as fleshed out as they should be. 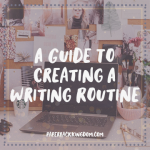 Many new writers will get caught up with the minor details—how their character looks, what they’re interested in, who they hang out with—but don’t think about how larger aspects can affect their personalities and lives. I’m talking about things such as morals, skillsets, weaknesses, and most importantly… their upbringing. 1) What were their parents like? As the leading influencers in your character’s life, parents have a big impact. If your character grew up in a broken home with parents who were constantly fighting, broke, doing drugs or drinking alcohol, it probably had a bad impact on your character. Maybe they have commitment issues after being in an environment where their parents didn’t demonstrate love and romance. Or maybe they’re used to being let down by their parents and having alcohol and drugs prioritized over their school supplies and lunch money. On the other hand, maybe your character’s parents were really protective and nosy—always making sure the character was focused on getting good grades and making them check in constantly when out on their own. These kinds of influences and behaviours not only demonstrate the traits your character might learn, but also how your character handles different situations in life . 2) Who did they grow up surrounded by / interacting with? Think about the kind of people in your characters life and the impact they left on them—whether it be good or bad, inspirational or degrading, protective or terrifying. Maybe the neighbour look out for your character—or maybe they kept trying to lure them into their cellar. Maybe your character’s childhood friend gave them treasured memories—or maybe they bullied the character and made their life hell. Alternate influences can have big impacts on your character’s life and memories. 3) What deeply ingrained habits or beliefs might be affecting their choices today? Maybe your character has a habit of flinching to loud noises due to their home environment, or maybe they believe they’ll never amount to anything after being told as much their entire life. Or maybe your character is ambitious and strong and yearns to make more of themselves, despite their upbringing, and is driven to do so because of how they were treated. Again, think about the other influences in your characters life—maybe someone’s words made that subtle mindset shift in their head? Or perhaps an ongoing stream or negativity made it harder for the character to believe otherwise? Another scenario is a character being extremely frugal with money due to never having any—always looking for discounts and coupons, always buying the cheapest brands, and getting excessively jealous or upset with those who flaunt their wealth and spend frivolously. Alternatively, someone who was raised with wealth might have a poor charity mindset and be completely oblivious to those struggling—never thinking to help out by paying for lunch or lending a cent. Or, they might have been raised to be charitable and might go out of their way to do those things because they’re able to. Think about the lessons taught to your character over the years and how it affects them today.